This article is about the comedy troupe. 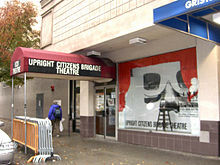 For the school and theaters the members of the troupe founded, see Upright Citizens Brigade Theatre. For the television series, see Upright Citizens Brigade (TV series). The Upright Citizens Brigade is an improvisational and sketch comedy group that emerged from Chicago's ImprovOlympic in 1990. The original incarnation of the group consisted of Matt Besser, Amy Poehler, Ian Roberts, Matt Walsh, Adam McKay, Rick Roman, Horatio Sanz and Drew Franklin. Other early members included Neil Flynn, Armando Diaz, Ali Farahnakian and Rich Fulcher. In 2013, Besser, Roberts and Walsh wrote The Upright Citizens Brigade Comedy Improvisation Manual. The Upright Citizens Brigade Theatre on West 26th Street in Manhattan, a former location. The Upright Citizens Brigade began performing improv and sketch comedy at Kill the Poet in Chicago. Their first show was called Virtual Reality. The group followed with shows titled UCBTV, Conference on the Future of Happiness, Thunderball, Bucket of Truth, Big Dirty Hands, The Real Real World, and Punch Your Friend in the Face. In 1993, the Upright Citizens Brigade (Matt Besser, Ian Roberts, Adam McKay, Rick Roman, and Horatio Sanz) were regular guests on stage at the New Variety produced and hosted by Richard O'Donnell at the Chicago Improv comedy club, 504 N. Wells. The original group, Matt Besser, Matt Walsh, Ian Roberts, and Amy Poehler have had two TV shows—Upright Citizens Brigade and The UCB Show—and their show ASSSSCAT has been televised twice. In addition to this they had a TV movie called Escape From It's a Wonderful Life and appeared weekly on Late Night with Conan O'Brien in the 90s. In the way of film, in 2002 they created and starred in the film Martin & Orloff, and made another movie in 2007 titled Wild Girls Gone. Neither film was particularly successful or well received. The group has participated in web series including the ongoing series UCB Comedy Originals, created in 2008, which occasionally shows sketches, and I Hate Being Single, created in 2012. In 2016, Universal Cable Productions announced signing Upright Citizens Brigade to a first-look production deal. ^ Raftery, Brian (September 25, 2011). "And... Scene". New York. Retrieved January 26, 2016. ^ Zinoman, Jason (February 20, 2014). "Get the Laughs, but Follow the Rules". The New York Times. Retrieved January 26, 2016. ^ Spitznagel, Eric (October 11, 1993). "The New Variety Just Might Make Comedy Dangerous Again". The Third Word. ^ "Upright Citizens Brigade Theater". Retrieved January 26, 2016. ^ "An Upright Citizens Brigade Theater Closes With Filthy Fanfare". New York Times. Retrieved 2018-09-09. ^ a b Deb, Sopan (10 January 2019). "Upright Citizens Brigade to Close East Village Location". The New York Times. Retrieved 10 January 2019. ^ Holloway, Daniel. "Upright Citizens Brigade Signs Deal With Universal Cable Productions". Variety. Retrieved 21 June 2016. Raftery, Brian (2013). High-Status Characters: How the Upright Citizens Brigade Stormed a City, Started a Scene, and Changed Comedy Forever. Brooklyn: Megawatt Press.